Axle Grind was part of the Bloodbath event. Axle Grind borrows the electric violence of the roller derby pack and transforms it into noise, vibration and the rock power chord. Axle Grind maps the collision data from the roller derby players to Joan Jett’s I Love Rock n’ Roll. 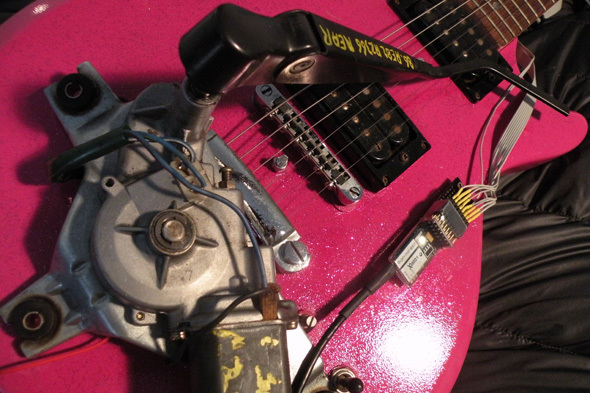 A robotic pink electric guitar hangs in the space, activated by the ramming of the derby blockers on track. Axle Grind is about jamming with the jam, generating a soundtrack of spectacle. As each hit happens a power chord is played to progress the song, a marshalling of stacks, a G-force Jam. Bump data from the roller derby players is sent via OSC to a max patch running on a laptop. The patch triggers sound and turns the strummer and chord changers (solenoids) on the physical guitar. The sound is returned to the laptop, mixed and sent back out to the speakers. The bump data is also displayed on the video screen and mixed on top of a live video feed of the physical guitar. Thanks to Jon for programming, Liz for infinite patience and modelling and Rod Nash for ideas for the chord changer mechanism. And of course the lovely BUMP crew: Kate Richards, Linda Dement, Francesca Di Rimini and Nancy Fluoro Maude.